To date, at least. 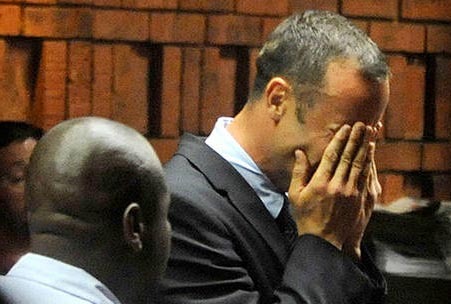 Oscar Pistorius in court, by Antoine de Ras (cropped). Pistorius is rich, so his suits fit him well, which explains why at a glance you can tell how fit he is even inside all that clothing. First thing I noticed, actually. This particular image has come under a lot of discussion regarding the legalities, etc. The funny thing is, nobody has bothered contacting me to find out more except AP and local [South African] media companies. Well, here we are, Antoine. The big question is whether I was in contempt of court for taking the image! Firstly that photo was taken from outside court through a small pane of glass in one of the court’s back doors. The area outside was jam-packed with public as well as general media trying to catch a glimpse of court proceedings using video, stills, and cell phones, with a lot of the usual jostling for space. I stayed glued to my small patch for close to an hour and had my height as an advantage. He then swiftly appeared, cried briefly and sat down. From where I was positioned, we could not see the judge or hear him setting down the rules with regards to video and stills in court. Apparently he only mentioned these rules after Oscar had wept. Our lawyers will be taking the matter further tomorrow with the presiding judge to help clear the air as there were complaints from Oscar’s defense team who were agitated by journalists who were miffed/upset for not getting good usable footage of him!